use the above switch to increase the variable size limit. this is for Synth 8-3391 Error. This is probably fixed. Asymmetric read/write width support. setting controlSetsOptMaxFlops to 10000 will further allow optimizations on control sets into registers. Helps with how the Vivado Synthesis compiler is unrolling loops. the address register is not pulled into the block RAM if it has a feedback structure so this workaround is needed. This will pull reset from the address register so that it can be used to infer BRAM. This entry was posted in EDA, FPGA on 18. January 2015 by muzafferkal. Vivado implementation tools are really getting close to their ASIC counterparts in terms of capability. The command phys_opt_design now implements useful skew insertion to meet timing. 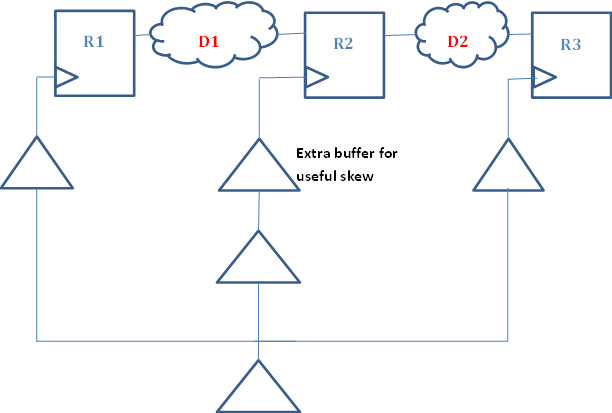 Useful skew is a technique where clock tree is manipulated to have non-zero skew for pipelines which are not completely balanced. Imagine 3 registers, R1, R2, R3 and 2 combinational blocks between them D1 and D2 between R1, R2 and R2, R3 respectively. 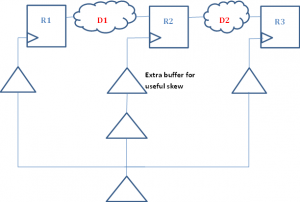 Now if the delay of D1 block is longer than D2 and this causes timing failures, one has several options to remedy this situation. One can change the RTL and try to balance D1 and D2. This is the least desirable solution as it forces one to run all the regression tests again because RTL is modified. The second solution is to apply register retiming during implementation, ie let the physical optimization tool move some of the logic from D1 to D2 at mapped, maybe even placed gate level. This has a lower cost than RTL changes but it complicates formal verification efforts because now the RTL pipeline does not match gate level pipeline and formal verification needs to understand what retiming has been done. Also one has to verify that no sequential behavior has been changed. The third and the lowest cost option is to add useful skew to the design. This is accomplished by increasing the time available to D1 block and reducing the time available to D2 block by adjusting the clock tree. Usually clock trees are designed for zero-skew ie all registers in a clock domain see a clock edge as close to each other as possible ie all leaf nodes of a clock tree to each register have the same delay from the root. This facilitates hold timing correctness and flops usually have a output delay larger than hold requirement so with zero-skew even a shift register with no delay between the two registers is guaranteed to have no hold violations with zero-skew. Useful skew changes this design paradigm. In our example because D1 is longer than D2, when it misses timing, there might be positive slack in the D2 path. In this case if we increase the skew to R2 register, this will make more time available to D1 path and less time available to D2 path. If D2 path has enough positive slack, this will allow both paths to meet timing. This method is the least costly as it is implemented in a post-place, post-route design by the tools and it doesn’t need any change in RTL or logic changes after synthesis and keeps the formal verification flow simple. This entry was posted in EDA, FPGA on 3. November 2014 by muzafferkal. This option is extremely useful for post route optimizations for 7 Series designs. I recently had a design where route_design ended with 980 ps of negative setup slack and phys_opt_design -directive AggressiveExplore was able to reduce it to 69 ps of negative slack. At that point I moved one cell which was at the worst case path and another sequence of route_design -tns_cleanup + phys_opt_design -directive AggressiveExplore managed to push it to 15 ps of negative slack. At which point I stopped optimizing. This entry was posted in EDA, FPGA on 2. November 2014 by muzafferkal. AXI has 5 channels: read and write address, write data, read data and response channels. Of these read and write address channels are identical and other channels have minor differences from each other. As someone with a decent programming background (in addition to strong logic design), it was pretty obvious that one could design an address channel interface and embed two of these in an AXI interface. The other interfaces could be managed with, say, inheritance or embedding (i.e. “ISA” or “HASA”) to account for the differences. Alas it was not meant to be. Interface don’t support sub-interfaces nor inheritance which restricts their use to very simple cases. This is such a shame. I am not even going to wish that it be fixed in the next version of the standard. By the time these get addressed in 1800 and are implemented by the EDA vendors, I am hoping that I’ll have moved to strictly C based logic design. This entry was posted in EDA on 22. May 2013 by muzafferkal. This entry was posted in EDA, FPGA on 31. March 2013 by muzafferkal. This entry was posted in Chip, EDA on 30. March 2013 by muzafferkal. I’ve been working on a design which is implemented on a Xilinx Series 7 FPGA. I had a -50ps timing violation and it seemed that the placement of the cells in the critical path could have been done better. In an ASIC flow this would be quite easy to fix but previous generation of Xilinx tools didn’t support this functionality easily. The current Vivado toolset is significantly better. It turns out after a design placed & routed, it is possible to move cells with “unplace_cells, place_cells” commands and run route_design again which in turn repairs all the generated DRCs and generates another valid implementation. Kudos to Xilinx for delivering a good set of tools worthy of the Series 7 FPGAs. BTW the final timing result is -8ps which is good enough for this prototype; although fixing it would not have been difficult if needed. This entry was posted in Chip, EDA, FPGA on 6. March 2013 by muzafferkal. I have been using Vivado toolset for a month now, on & off as I have current designs on Spartan 6 and Virtex 5 which need RTL improvement so ISE is still in use but I find myself wanting to go back to the Kintex project so that I can use the Vivado back-end tools more and more. I am also working on a Zynq system which will replace the existing hardware so future looks nice. In terms of Vivado back-end, the timing system is a big relief from UCF. Full SDC constraints are supported with an embedded TCL interpreter. So far I have seen one bug where the timing optimizer sometimes hangs while fixing holds but it is rare and I have heard from Xilinx that they know about it and have a plan to fix. Vivado simulator luckily is not specific to series 7 chips and its UI is slightly better than ISE simulator. One welcome addition is the ability to view buses as analog waveforms which is nice. Last but not least Vivado HLS is quite interesting too. So far I have written a small amount of fixed-point C++ code and translated it to RTL but not compared to QOR to my existing hand-written RTL but it’s nice to know that there is an option. Overall Vivado family is evolving nicely and I am pretty happy with the current performance. This entry was posted in EDA, FPGA on 22. January 2013 by muzafferkal.